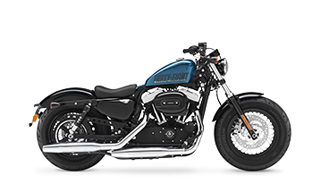 Launched 5 years ago, the Forty-Eight® gets its name from the year its famous peanut tank was first introduced. A true urban warrior, its distinctive custom stance, (as well as its agile handling) come largely from its short chassis, lowered front suspension, low profile, solo seat and fat balloon tyres. Of course, the aforementioned 1948 tank sitting above a big 1200cc Evolution® engine make a significant contribution, too. And did we mention the under bar mirrors? Well we have now, but there’s so much more we haven’t about this, and all our Dark Custom™ collection. So you’re gonna have to come see for yourself.